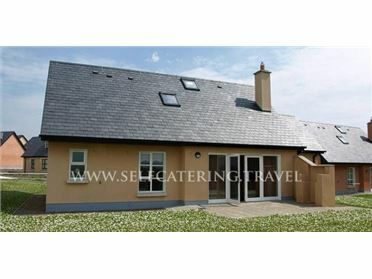 Tigh Bawn is a detached bungalow situated on the outskirts of Rosslare Strand in County Wexford, Ireland. Occupying four bedrooms including three doubles and a family room, along with a family bathroom and shower room, the property can sleep nine people. Also inside you will find a kitchen diner, a utility and a sitting room with an open fire. To the outside there is off road parking, roadside parking and a garden with a lawn and patio with furniture. Tigh Bawn is a homely cottage in an ideal location for exploring the South East coast of Ireland. Oil central heating with open fire. Electric oven and hob, microwave, fridge, freezer, washing machine, tumble dryer, dishwasher, Smart TV with Saorview, DVD, WIFI, selection of books, games and DVDs. Fuel, power and starter pack for fire inc. in rent. Bed linen and towels inc. in rent. Off road parking for 3 cars, additional roadside parking in front of property. Lawn and patio garden with furniture. Sorry, no pets and no smoking. Shop and pub 1 mile..